Mr sterile Assembly are a two-piece from Aotearoa New Zealand. Formed in 2001, the group mutated through many versions of the line-up till they settle on the number two. The changes were intentional, and during this time they released 4 albums, a book, and toured in Australia, Eastern Europe and Southeast Asia. They have been classified as punk, math rock, experimental, noise rock, alt rock and outsider punk, and think the latter is as close as it gets. They have a distinctive, South Pacific sound based on unusual and urgent time signatures, repetitive heavy rhythms, and angular lyrics. Songs are typically epic, with complex arrangements, and often recount the personal stories behind current or historical events. 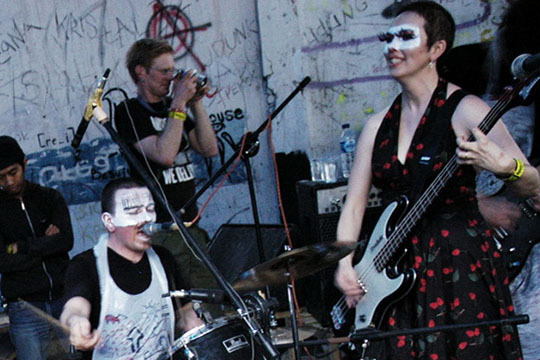 mr sterile Assembly are known for their mercurial nature, and have produced some diverse recordings and events. Most notably, for their recent album, Transit, mr sterile commissioned or was gifted an art work for each song and are currently touring the exhibition in NZ. They recently supported CRASS front man, Steve Ignorant and his band but you could just as easily find them playing a fund raiser on the back of a flatbed truck for a local small town fair. Over their 10 years, sterile have continuously re-invented themselves with shifting line-ups and collaborations. The current two-piece line-up is reportedly the most assertive and explosive to date.